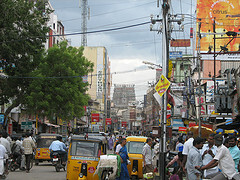 Madurai is the second largest city in Tamil Nadu. One of the oldest continuously inhabited cities in the world, Madurai developed on the fertile plain of the River Vaigai and has been a major religious centre and settlement for two millennia. Today it is an important educational, industrial and tourism hub, but retains many remnants of its historic origins. The intricate network of rivers, channel, canals, tanks and groundwater forms the city’s essential blue-green infrastructure, providing water, drainage and sanitation for domestic, agricultural and industrial use. The city is growing rapidly, and is expected to rise from 1.4m in 2011 to over 2 million people by 2031. This will lead to further pressures on infrastructure, housing, and basic services. is taken soon to future proof Madurai’s development. These are risks such as water scarcity, climate change, growing traffic congestion and damage to important natural habitats. The city is likely to be particularly impacted by climate change. Madurai lies in a warm- humid climatic zone, which is hot and dry with intermittent and irregular rainfall. Increase in average temperatures and rainfall variability will lead to wide ranging effects on many sectors, including food and water systems, human health, buildings, transport, energy and ecosystems. These are the major findings of a comprehensive ‘Future Proofing Urban Diagnostics’ process which was completed by Madurai Municipal Corporation in January 2014 with support from a CDKN project led by Atkins, the Dhan Foundation, and University College London. Based on this analysis of the risks facing the city, the Corporation was supported to identify priority actions to tackle these challenges. Future proofing is about identifying and developing solutions which can respond to the risks associated with issues such as climate change, resource scarcities, and damage to vital ecosystems but in a way which catalyses broader economic development, improves access to basic services, and tackles urban poverty. Over a period of around one year, a series of action plan proposals have been shaped and supported by a range of stakeholders in the city. The process of action planning has been used to develop, deepen and share understanding between different stakeholders, as well as exploring and initiating discussion of what the opportunities could be for the city to address its existing vulnerabilities and adapt to climate risks which are expected to impact the city. The city government and stakeholders identified ‘blue green infrastructure’ as the priority issue that required action. The blue-green infrastructure approach is essentially about demonstrating how to manage the interconnected set of challenges relating to water resources management (surface and ground water), water supply, water quality, sanitation, solid waste management, flooding and conservation of natural ecosystems in the context of the urban development trajectory of the city and its changing climate. Governance and future proofing planning. Within each theme, actions were identified covering enabling infrastructure improvements, policy and regulatory improvements, and strengthening social capital and governance. The overall strategy for future proofing the blue-green infrastructure for Madurai is to build up a programme of projects and actions which reduces vulnerability and address, climate and water security risks, while delivering multiple benefits to the community. 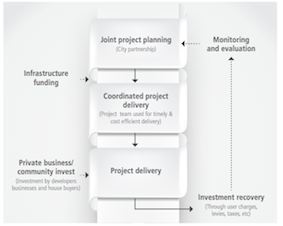 The proposed timetables for each project focus on improving adaptive capacity and addressing critical system links before investing in slower moving long term risks. A significant proportion of the plan is focused on how to enable implementation and good governance for the projects. Action planning has galvanized and brought together stakeholders in Madurai to address the problems of the city. To build on this momentum, a number of structures to support the co-ordination and management of the projects. This includes: an enhanced city partnership body and a strong bridge to the community. Lastly, the potential sources of finance for each project has been identified. This includes city, state and national resources as well as tapping into international climate finance and the private sector. A number of meetings and consultations with these agencies are underway to explore avenues and mechanisms for identifying the resources for implementation. “This cooperation has helped the city take stock of the existing issues around the city and look at them in a new light. I would like to thank all those who participated in this initiative.